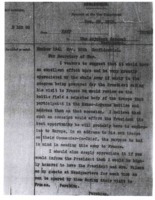 Subject contains "Argonne, Battle of the, France, 1918"
General Pershing agrees that it would be a good idea for President Wilson to visit the American troops on his trip to France. 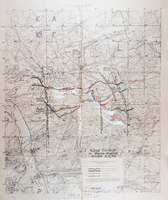 A map of the 42nd (Rainbow) Division in Meuse-Argonne. Cpl. 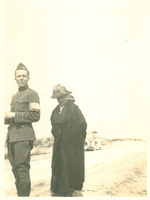 Allen in a German dug out on Dead Mans Hill, Argonne. Solid concrete Observation Post Argonne Forest near Esnes. Direct hit on a German tank Argonne Forest. Crown Prince headquarters at Mont Faucon. Crown Prince escaped capture here by 3 minutes. Mrs Lansing stepping gingerly over a hand grenade capt Garfield.